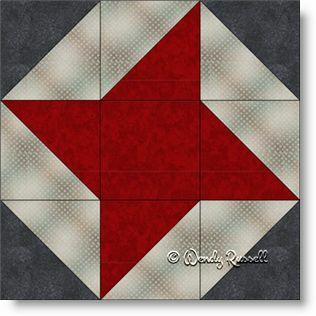 This Friendship Star quilt block is a basic nine patch block featuring the first pieced patch you will learn as you start your quiltmaking journey -- the half square triangle. I love this block -- first for its simplicity -- and then because as you place it beside other Friendship Star blocks, you will see a secondary pattern emerge. For this very reason, this quilt block is also known as Ribbon Star because the stars seem to be separated by "ribbons". I like to make this block in one of the smaller sizes, just because you get to see more of them as you put them into your quilt. This block also makes for a wonderful choice for a "scrappy" quilt. The sample quilts illustrated show a setting side by side, which shows the "ribbon" in a diagonal manner, while the second quilt is set on point with sashing, creating a totally different look. This just goes to show that just because a block is considered "easy" it does not mean your quilt will not be interesting.